2015 Stephen Berry Free Press Champion Award winner Mary Mason speaks after she and co-winner James Compton were given the award by IowaWatch executive director Lyle Muller the night of Oct. 8, 2015. 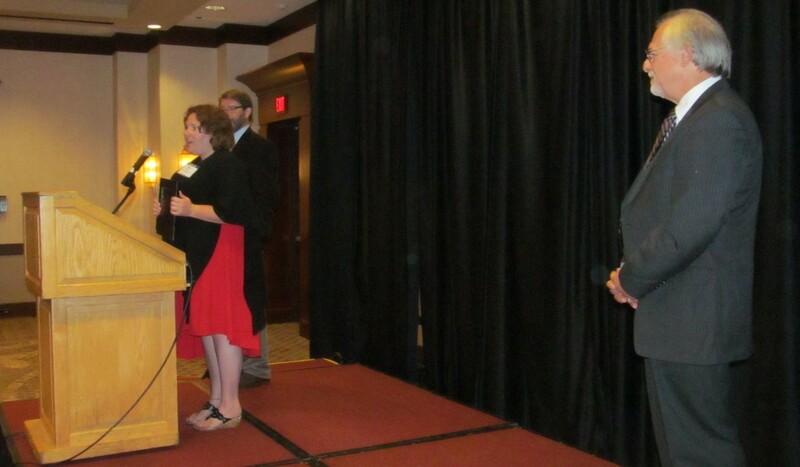 A former Muscatine Community College student newspaper editor and that paper’s former faculty adviser were awarded the IowaWatch Free Press Champion Award for working Iowa journalists or journalism educators Oct. 8, 2015, at the annual IowaWatch Celebrate a Free Press and Open Government banquet in Des Moines. Also honored at the banquet were the first director of Iowa’s three-year-old Iowa Public Information Board and a longtime advocate for the Iowa newspaper industry. 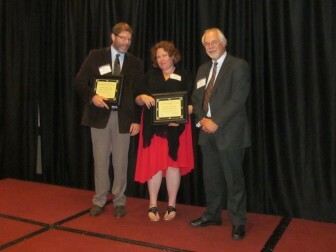 2015 Stephen Berry Free Press Champion Award winners James Compton and Mary Mason with IowaWatch executive director Lyle Muller the night of Oct. 8, 2015. The Stephen Berry Free Press Champion award was presented to Mary Mason and Jim Compton, both of Muscatine, and the 2014-15 staff at The Calumet newspaper. Mason was a student at Muscatine Community College and editor of the student-run The Calumet when the newspaper got involved in controversy in 2013 and 2014 reporting factual information that upset school officials. The newspaper’s first report was about Student of the Month award winner in a competition for which her uncle was a judge, followed by a story about a grant received by a faculty member who objected to how the newspaper handled the story. Compton was the newspaper’s faculty adviser before the college removed him from that role. He, Mason and Lisa Powell now run their own monthly newspaper, The Spotlight, with help from the Society for Professional Journalists and a GoFundMe campaign. Their award is named after IowaWatch co-founder Stephen Berry. 2015 Randy Brubaker Free Press Champion Award recipient Keith Luchtel with Muller. The Randy Brubaker Free Press Champion award, which goes to someone whose work as a nonjournalist upholds and promotes open government work was presented to Keith Luchtel of Des Moines. Luchtel came out of retirement as a long-time lobbyist with the Nyemaster Goode law firm for media organizations, open government and the First Amendment to become the first executive director of the Iowa Public Information Board. He was vital in getting the board started after it was established in 2012. Luchtel retired again in 2014 but went back to work, this time with Strategic Elements as a senior policy advisor. His award is named after Randy Brubaker, a long-time managing editor and newsroom manager for the Des Moines Register who died in 2014. 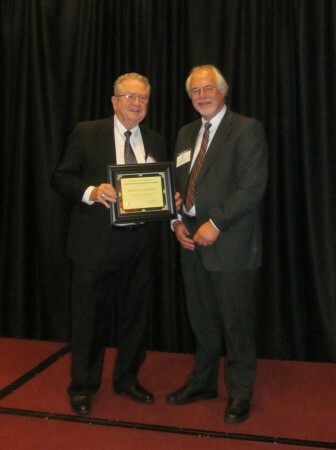 Iowa Newspaper Association executive director Chris Mudge receiving the Iowa Freedom of Information Council’s 2015 Harrison “Skip”Weber Friend of the First Amendment Award from council president, Brian Cooper, on Oct. 8, 2015. 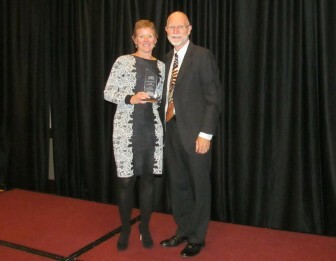 The Iowa Freedom of Information Council gave its annual Harrison “Skip” Weber Award for individual contributions to government openness, access and accountability to Iowans to Chris Mudge, the retiring executive director of the Iowa Newspaper Association. The association represents 300 Iowa newspapers, provides services for the Wisconsin Newspaper Association and the Michigan Press Association, and it is the lead lobbying voice at the Iowa Capitol for issues of open, transparent government. Among her many accomplishments Mudge also has been active in the Iowa Freedom of Information Council, serving as a trustee and member of the executive committee. The banquet, titled this year “Journalism’s Core…The Contemporary First Amendment,” took place at the Downtown Des Moines Marriott. Hosted by The Iowa Center for Public Affairs Journalism-IowaWatch with the Iowa Freedom of Information Council and Iowa Newspaper Foundation, the banquet ended a full day of activities in Des Moines of bringing attention to the need of an independent news media and open government in our democracy. Ken Paulson of Newseum’s First Amendment Center leads an exercise on First Amendment knowledge at the Oct. 8 Celebrating a Free Press and Open Government Banquet in Des Moines. 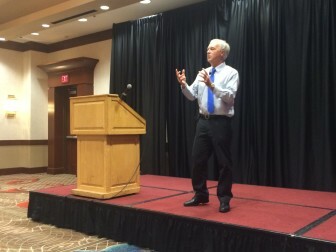 First Amendment expert and educator Ken Paulson was the banquet’s guest speaker. Paulson is president of the Newseum Institute’s First Amendment Center, former editor of USA Today, and former leader of the Freedom Forum and Newseum. He currently is dean of the College of Media and Entertainment at Middle Tennessee State University. The Iowa Center for Public Affairs Journalism-IowaWatch is a 501(c)3 non-profit news organization dedicated to producing independent, non-partisan, explanatory and investigative reports on matters of public interest and furthering the education of young journalists in Iowa. Register now for the IowaWatch annual banquet. First Amendment expert and educator Ken Paulson will be the guest speaker at the third annual Celebrating a Free Press and Open Government Banquet, titled this year “Journalism’s Core…The Contemporary First Amendment.